This blog is dedicated to great books and the people who love reading them. The texts we highlight on this page are the reads, and seeds are the ideas that inform them. Knowledge, provided by literature is like fertilizer for these seeds. We hope the readers of the books, and of this blog, grow with every post. The name reminds me of my favorite Eric Carle book The Tiny Seed. The Tiny Seed is about the development from a small seed into a glorious garden. I think it is a great metaphor for the way a small idea, a single person, or a humble act can manifest into a revolution. One teaching this book can highlight that message, or they can discuss the way Eric Carle describes the gardening process. 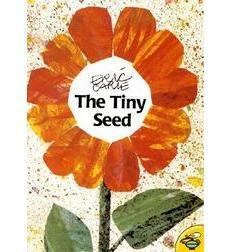 The Tiny Seed is a great investment for readers, gardeners, and dreamers of all ages.